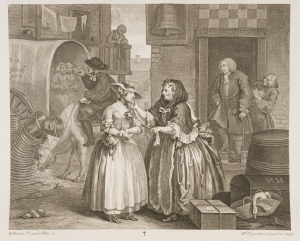 William Hogarth was known for numerous reasons in and around the world. Not only was Hogarth a known and famous painter from the English background, he was also known as an editorial cartoonist, pictorial satirist, printmaker as well as a social critic. William Hogarth was born on 10th November 1697 and lived for 67 long years before he passed away on the 26th of October, 1764. The range of the works of William Hogarth started from the realistic portraits and went straight up to series of pictures of the type of comic stripes, which he named as “Modern Moral Subjects”. The best known moral series of William Hogarth were A Rake’s Progress, A Harlot’s Progress and Marriage A-la-Mode. 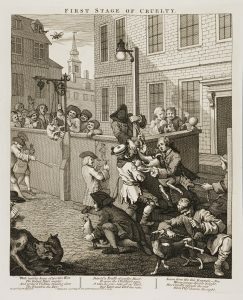 The illustrations of the satirical political were named “Hogarathian” due to the fact that the knowledge put into every works of William Hogarth was highly pervasive. William Hogarth belonged to a lower middle class family and was born in London, England, with the exact place of birth being Bartholomew Close. He was born to Richard Hogarth and Anne Gibbons. His father was a Latin teacher at a school and also a textbook writer and but wasn’t that strong economically. During the young age of William Hogarth, that is, at the time of his youth, he underwent lessons of engraving trade cards and products of similar type to Ellis Gamble, located at Leicester Fields. William Hogarth’s father, Richard Hogarth was a person of mixed fortune and is said to be imprisoned at a time due to not being able to clear the debts which were outstanding. This event is known to give a hard edge to the prints and the paintings of William Hogarth. The works done by William Hogarth were bawdily sexual at times but most of the times it was based on satirical caricatures. This was highly due to the influence he received from the Italian and French engravings and paintings. These works of William Hogarth gained popularity at a wider level and is known to be one of the most significant artist from the English background during his existing generation. William Hogarth started taking live interest at the London fair and the street life of the metropolis. William Hogarth started sketching any character he would come accross. Later, he was known to be a member of the Rose and Crown Club along with many other known artists, namely, Michael Dahl, Peter Tillemans, George Vertue and many other artists as wells as connoisseurs. One of the most known works of William Hogarth was the “Beer Street and Gin Lane” which was a print published in the year 1751. The main theme of this print was to warn the society of the consequences of taking alcohol. This entire print was subdivided into two parts. First being the Beer Street and the second being the Gin Lane. Beer Street on one hand was a print which portrayed a city full of happy people enjoying the English beer, which was considered as the ‘good beverage’. 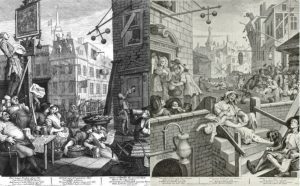 Gin lane on the other hand, was a print which portrayed the effects which can appear due to drinking gin. This is because, gin is a liquor which is more potent than the English beer, it caused the society additional number of problems. In the Beer Street print, one will find the people to be very happy, prosperous and healthy. In the Gin Lane, one will find the people to be careless, scrawny and lazy. In the print Gin Lane, one will find a woman as the centre character who is letting her baby to fall and die. This was made in relation to the story of Judith Dufour. In the story, to get money for Gin, Judith Dufour literally strangles her baby to sell the clothes. This print of William Hogarth was published in the year 1751 with the specific theme in order to show support for the then launched Gin Act of 1751. Shortly after the works of William Hogarth, that is, Related Wings and An Enquiry into the Causes of the Late Increase of Robbers, the Beer Street and Gin Lane were published. It is known that the works Related Wings and An Enquiry into the Causes of the Late Increase of Robbers narrated the same issues as the one which is mentioned. It is said that maybe, William Hogarth was helped by his friend Henry Fielding, who was a magistrate, in enlisting William Hogarth so that he could help with the propaganda for the then launched Gin Act of 1751. The Beer Street and Gin Lane are considered to be one of the best moralising arts of William Hogarth amongst five others. The other works of William Hogarth based on moralising arts were Harlot’s and Rakes’ Progresses in the year 1731 and 1733 to 1735 respectively. Marriage A-la Mode in the year 1743 to 1745, Industry and Idleness in the year 1747 and the Four Stages of Cruelty in the year 1751.